R.C. Sproul: In our day, there has been a strong antipathy emerging against confessions of any stripe or any degree . . . Without such confessions, theological anarchy reigns in the church and in the world. Ligon Duncan: I think denominations, institutions, and churches that reject confessions are made vulnerable precisely in the two areas that creeds and confessions help us most. They’re vulnerable to failing to adhere to biblical doctrine and to teaching a clear system of biblical doctrine to their people. "A Protestantism which fails to acknowledge those historical roots and indeed to teach them to its young people leaves itself vulnerable to Canterbury and Rome"
"[I]t is critical that in educating the rising generation within the Church, there is proper acknowledgment of the role of history in the formation of Christianity and a proper appreciation for the richness of the Christian heritage." Read more about "A Protestantism which fails to acknowledge those historical roots and indeed to teach them to its young people leaves itself vulnerable to Canterbury and Rome"
Sanctification, Heidelberg, and the "third use of the law"
Read more about Sanctification, Heidelberg, and the "third use of the law"
Are the Apostle's and Nicene Creeds Sufficient? Here we discuss the idea of whether or not the Apostles and Nicene Creeds are a sufficient basis of doctrinal agreement for the Church today. This view, called “Paleo-Orthodoxy,” has been espoused by theologians like Thomas Oden, who argues that the creeds embody the consensual doctrinal affirmations of the early church fathers. This idea is also proposed by Jim Belcher in Deep Church which we reviewed at DrIBEX Ideas (you can find those reviews by searching the blog for “Belcher”). Before we think through this proposal, perhaps it would be good to post those creeds so we can better understand what we are discussing. This will also be helpful for readers who do not affirm the creeds as part of their weekly liturgical worship. I will list the creeds as they are recited today although the clause, “He descend into hell,” was not in the earliest form of the Apostles Creed (see my earlier post on that subject). Read more about Are the Apostle's and Nicene Creeds Sufficient? Did Jesus “descend into Hell”? We discussed this one Wednesday night in our Doctrinal Disciples class. Here is a summary of the issue. A commonly held view is that Jesus descended into Hades between His death and resurrection. Its popularity stems from the statement “he descended into hell” in one version of the Apostles Creed affirmed in many churches. It also appears to be supported by some NT texts such as Ephesians 4:9 and 1 Peter 3:19. This view usually argues that Jesus emptied the compartment of Sheol/Hades that contained the OT saints, whom He then transferred to heaven (“he led captivity captive” Eph. 4:8). First, a little history. 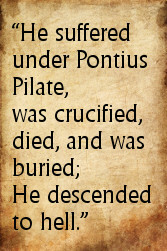 The earliest form of the Apostles Creed (2nd century AD) did not contain this statement. It appeared first in a Latin text of the Creed in the 6th century AD (descendit ad inferos, “he descended into the lower regions”). From there it began to appear in Greek versions of the Creed and finally morphed into “he descended into hell” in the Middle Ages. This statement was not included in the more detailed Nicene Creed which dates from 325 AD. Thus it appeared in no creed before the 6th century AD. It may have been mentioned by some of the fathers, but it definitely was not a distinctive doctrine confessed by the early church. The view developed quite fully in the Middle Ages. The expression “the harrowing of hell” describes his supposed action in emptying hell of its righteous OT inhabitants. They were supposedly the ones on the other side of that “great gulf” between the righteous and the wicked. But if it was such an important aspect of our Lord’s saving activity, why did it develop so late in church history? If someone asks me what happened to Jesus after his death, I simply quote what Jesus stated and leave it at that: “Father into your hands I commit my spirit” (Luke 23:46). Why is that so difficult to understand? Read more about Did Jesus Descend into Hell? I just finished reading a marvelous little tome by Carl Trueman, The Creedal Imperative, and cannot help but exclaim its merits. It is, in a word, an apologetic for the discipline of systematic theology, but more than this, an apologetic for publicly chronicled and shared systematic theology, subscription to which serves as the standard of ecclesiastical fellowship. Carl Trueman is, of course, a Presbyterian, and he and I do not subscribe to the selfsame doctrinal standards. This does not detract, however, from his argument, because the creedal imperative for which he argues is not one of specific content, but one of principle. Trueman naturally favors his own creedal/confessional standards, but argues that even a flawed confession can be superior to none at all. To that end Trueman magnanimously appends to his work a bibliography of confessions and polity manuals from several ecclesiastical traditions. That creeds are sometimes treated as independent, a priori sources of authority is an unfortunate reality. But this reality does not detract from their value as a posteriori summaries of biblical teaching. Indeed, Trueman argues, the development of such summaries is a matter both of (1) biblical propriety and (2) ecclesiastical necessity.